We would like to emphasize that the monthly newsletter can not live without the contributions of FlightGear users and developers. Everyone with a wiki account (free to register) can edit the newsletter and every contribution is welcome. 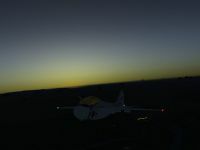 So if you know about any FlightGear related news or projects such as for example updated scenery or aircraft, please do feel invited to add such news to the newsletter. On January 17, the release branches were created from our Git repositories. From then on, no new features (and aircraft) shall be pushed. Only bug fixes are accepted. Development for the next release 2.8.0 has already started. 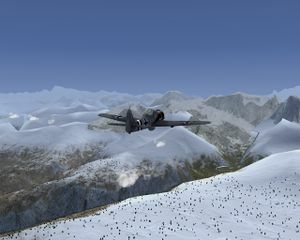 FlightGear 2.6.0 will be released on February 17! In order to fix bugs we first need to identify them. That's what we create release candidates for. These are basically complete releases, meant for testing by a large group of people. As the actual release is still some time away, bugs found during these tests have a fair chance getting fixed. Do note that the earlier bugs are reported, the more time we'll have to fix them. The release candidates are available at our website. Please help us create a release with a minimum amount of bugs! If somebody would like a specific feature implemented, it will be posted in the wiki. Then if somebody wants to take on the development, they can start it and if they feel they have fulfilled the requirements, they submit the project to the person who is offering the bounty. If it is a feature that many people want, quite often more people are adding to the bounty and then each person decides individually if the result fits their ideas and if they want to pay the bounty. A bounty is a specific amount of money for completing a specific task which can be claimed by an individual or group which completed that task. Read on at Bounty (Overview). 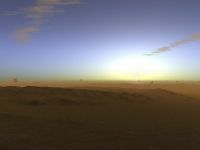 As part of the ongoing efforts to make the skydome scattering shader blend seamlessly into the terrain under all conditions, substantial work on getting sunrise and sunset conditions right has been done. The eventual solution to the problems are lightfield shaders - the shader doesn not assume a single light source for the whole scene, but computes the incident light intensity and hue for each point of the scene dependent on position and altitude. This turns out particularly tricky for the fog, as the visible fog color is really a line integral along points with very different lighting - which is too slow to do real-time, so a good approximation scheme has to be used. 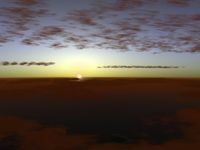 The development effort for the lightfield shaders is easily five times the effort for the original terrain haze shader which handles everything during daytime - which illustrates a bit how complex problems sunrises are. 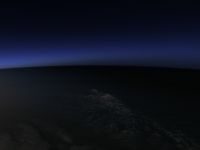 The shaders handle a variety of conditions and generate spectacular scenes, from the first glow of the predawn sky, via high altitude clouds lighting up before the terrain to full daylight. 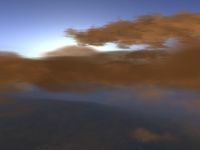 The action of the shaders interfaces with the environment conditions. 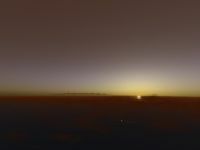 For instance, high altitude haze makes the indirect ground light more red than blue since it causes substantial backscatter to the ground. Cloud cover blocks the incident direct light on the haze layer and cause a change in hue of the haze illumination. 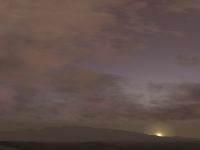 The Local Weather system provides the necessary interface information - for instance at the egde of a cloud layer, direct light can reach underneath the layer and illuminate the haze, causing a change in the shader response. Also, the self-shading of the haze layer leads to a different haze hue on the ground and at higher altitude. All these effects do not currently mesh with other shaders. While eventually an integration with other projects is discussed, the lightfield shader code will hopefully make its appearance on Git soon as an optional feature. 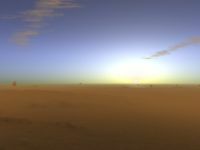 As a preview, here's what may come next - a mode detailed light attenuation model in which the darker hue of the fog beneath clouds is really prominent. In each edition we have an interview with a contributor. Suggestions for possible questions are available on interview questions, you are invited to come up with new questions and interview ideas obviously! Anyone is free to write an interview (with him-/herself or others) for next month's newsletter! If you'd like to help interview a contributor or get interviewed, please do consider adding yourself to the list of interview volunteers! Read this and previous interviews at our website's archive. What is your forum nickname? How long have you been involved in FlightGear? What are your major interests in FlightGear? What do you plan on doing in the future? Why is it that you are interested in flight simulation or aviation in general? Are you happy with the way the FlightGear project is going? What do you enjoy most about contributing to FlightGear? Are there any "hidden features" you have worked on in FlightGear that new users may miss? What advice can you give to new contributors who want to get started on their first aircraft/new feature/Nasal script? Be optimistic, be naïve, be realistic, and start modestly. Set yourself an attainable goal! I should probably explain what I mean by this. When we started out, back in 1996-1997, we were what I would now describe as incredibly optimistic in the sense that we believed that we could pull this off, but we were also somewhat naïve in the sense that we really didn’t have any firm idea about the challenges that lay ahead. But, we were able to pull it off, so this shows that we were right after all. But, if you want to contribute don’t start with your magnum opus. Before starting out, take some time to familiarize yourself with the project, get to know the code base, data structure or workflow. In addition, making a good first impression helps. Over the years we’ve seen a tremendous amount of grand ideas and not many of them have materialized, so we’re naturally a little apprehensive: you may not find an immediate warm welcome, but if you do come up with a well thought-out idea, you may convince the development team, especially if you can substantiate your ideas with some working code to back it up. 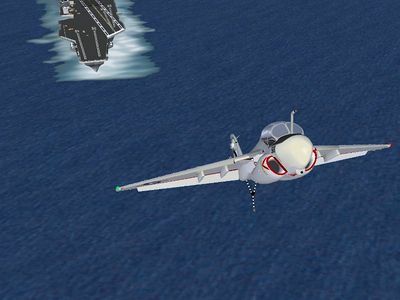 Have you previously used other flight simulators or simulation software in general? How does FlightGear compare in your opinion? Do you remember what first got you interested in FlightGear? How did you learn about FlightGear? In other words, why did you actually download and try FG? What was your first impression about FlightGear? Compared to other flight simulation software, what are FlightGear's major benefits in your opinion? Do you think it is necessary to know how to program in order to contribute to FlightGear? Have you ever used FlightGear professionally or for educational purposes? 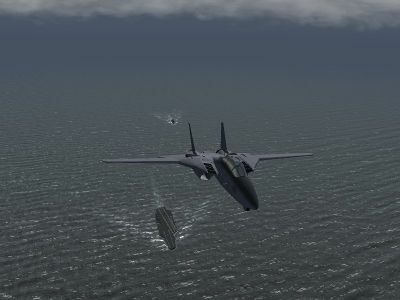 What about FlightGear as a "game", do you think it can be used as such? On average, how much time do you spend working with/contributing to FlightGear? Which of the more recent FlightGear developments do you consider most interesting/appealing? Is there some feature that you'd truly like to see in FlightGear one day? What do you think could be done to attract even more new users and contributors to FlightGear? What about interacting with the FlightGear community? Any tips/experiences you'd like to share? Nothing really special; just use your everyday courtesy, and keep realizing that we’re all volunteers. I’m usually not that active on the forum or mailing list, but I can tell from 15 years of experience that an intelligent and reasonable response is far more likely to create some momentum than a hurried response that is written in a spur of emotion. Also, I have observed that there is hardly any relation between action and words on either the mailing list or the forum. So when you're new to the community, just hang around, get to know the characters and try to establish whom you can trust to be a knowledgeable source of information and who just raises a lot of dust. Have you ever recommended FlightGear to other users, friends/family? Every now and then, easy-to-install development snapshots are created (usually, twice montlhy). 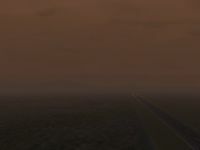 These snapshots depict a recent state of the development version of FlightGear. By using them users can test out features that will be included in the upcoming release. Testers are encouraged to file bugs at the issue tracker. The snapshot can be download via the links at the bottom of this page: http://www.flightgear.org/download/. Updates and feedback can be found at the forum. openSUSE now provides a dedicated FlightGear repository continuously delivering ready-to-use binaries of the latest development version ("Git" version) of the FlightGear Flight Simulator and many related utilities. 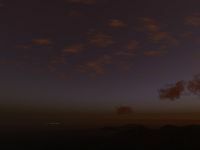 The binaries are regularly updated (not daily, but about weekly for FlightGear and a bit less often for the utilities). More utilities may be added, if someone is able to provide the necessary build script to pack the RPM. After installation, all tools should be pretty much pre-configured, and can directly be launched from the menu. For installation, use this link to select your openSUSE version and install fgrun + flightgear. Alternatively, you can add openSUSE's games:FlightGear:Unstable repository manually. After installation, you can select and install more FG-related utilities directly from YaST. Remember, the Unstable repository always provides the latest development version, which may not be suitable for inexperienced users. Until FlightGear 2.6.0 is released, this repository provides FlightGear 2.6.0 release candidates, so you can help with testing the new release. After the official release, FlightGear 2.6.0 and a stable version of all utilities will be available in the openSUSE games repository, while this Unstable repository keeps tracking the development versions (you could switch back to games after the 2.6.0 release). Maybe we can find volunteers to set up a similar service for other Linux distros, or at least try to add stable versions of FlightGear and all its friend-utilities to the distros, so Linux users no longer need to compile all utilities from scratch and solve installation issues. All the way back in May 2011, we adopted a new status-rating system for aircraft. So far, only a few have actually been rated, as can be seen in the list 'hockenberry' set up at Google Docs. If you're an aircraft developer and your aircraft is/are not on the list, please consider rating their status. All you'll need to know/do is described at Formalizing Aircraft Status. If you'd just like to get started contributing to FlightGear, this would also seem like an excellent way to get started. The Curtiss JN-4 "Jenny" has been added by helijah to his hangar. The Douglas DC-3 C47 has been updated by the PAF team. The improvements have mainly been made ​​in the cockpit because that is where pilots spend most of their time (hopefully! ), but many other details have been given around. If you know aircraft you know what is being cooked here on this image. Hang on while Syd, Xsain and PH-JBO are banging on the metal. Soon we will have a new one, with the thingies on the wings. I already know what you don't, it will be stunning! All liveries that were not available as downloads have been removed from the livery database. Most of those got lost when the former server suddenly quit (all the way back in December 2009). As we were able to save the list of liveries, they ended up in the database eventough the files got lost. To save liveries from future server failures, backups are nowadays made on a regularly basis. A Dutch artificial island currently under construction, as visualized with CLC2000 (top) and CLC2006 (lower) and OSM data. Martin now has what should be topologically clean CLC2000v15 and VMap0 edition 5.0 datasets. 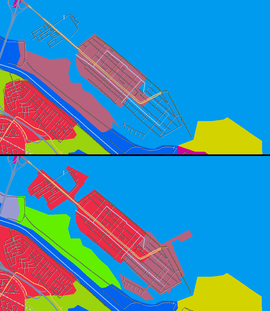 These have been loaded into the Landcover-DB as replacements for the old VMap0 and CLC layers. Thanks to the great folks at GRASS GIS, most notably Markus M., the procedure of cleaning large vector datasets like CORINE is now a matter of just a few days and runs on a machine with far less than 32 GByte of main memory! One year ago, cleaning CORINE took about one and a half months to complete just one single (!) of multiple iterations and you never knew if somebody would reboot the server while the job was still running (which actually happened several times). TerraGear's overall stability is expected to increase with topologically clean vector data. Merging custom land cover data (like John Holden's great work) into the "Custom Scenery" layer (at MapServer) had been failing in some cases due to topological inconsistencies. These failures are expected to disappear with topologically clean vector data. As soon as the various tools are working in a predictable manner, the driving motivation behind all the effort can be revived, which is to build an infrastructure for re-compiling the respective terrain tiles on a regular, maybe daily schedule after the land cover has been updated in a certain region. A clean CLC2006 is provided as well, but because that one's still incomplete (and work in progress, actually) CLC2000 is considered more important. CLC2006 focused mainly on the identification and mapping of land cover changes between 2000 and 2006. All land cover changes bigger than 5 ha have been mapped. CLC2006 is significantly more up to date in some areas, as can be seen in the image on the right. Just give the position of the shared object you want to delete, give a small comment on why you are deleting. After human validation, it will be deleted from the database and you should no more see it in Terrasync a few days later. After a couple of months of little (to none) development, Gijs released a new Windows binary of the TerraGear GUI. Other OS are supported, but require it to be build from source. OpenStreetMap and CORINE2006 added to the download feature. Material suggestions are given as well for those. Up to date with today's TerraGear builds. Most tools have a progress bar to give you a live overview of the progress. Removed unnecessary texts and error messages. Resizable dialog with proper layouting. Besides all that, several (small) bugs have been fixed. Overviewing the 60 wind turbines of Prinsess Amaliawindpark, 20km west of the Netherlands. The Netherlands have slightly less than 1900 windturbines at the moment. Since this month, 757 of them are in FlightGear! Adding them is relatively easy. Since we have a generic windturbine model available (Models/Power/windturbine.xml), it's just a matter of finding the GPS coordinates. Some of the larger windparks list locations on their websites. 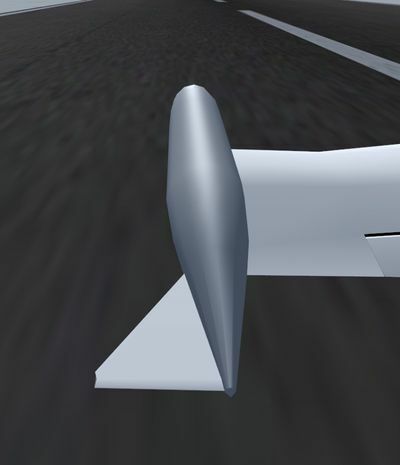 Other windturbines can be positioned based on the FlightGear scenery (with CORINE data, for more accuracy), or via satellite imagery. Some countries even have a site similar to this website from the Dutch government, that has a map that shows the locations of all windturbine(park)s.
Locations for windturbines and other shared objects can be easily submitted via the new submission form, that we mentioned in last month's newsletter. For the offshore Prinses Amaliawindpark, a custom windturbine model has been made. Resembling the Vestas V80-2.0 MW edition. The model can be easily re-used on other offshore windparks, via the method described above. The Airport of Congonhas is currently being modeled, completely from scratch, by the Grupo FG BR. Download our logo and link us, please. Several years ago during a trip to Washington DC, my family got tickets to a flight simulator ride at the Air and Space Museum. All of us were amazed at the innovation of the Smithsonian's interactive simulator ride, having grown accustom to the common, mediocre, hydraulic-platform simulators often seen at carnivals and amusement parks. These simulators could roll 360 degrees, continuously, and could tilt about 30 degrees along the pitch axis. Inspired by that experience, our group ("Team Viper") is attempting to create an even better version. Like the one at the Air and Space Musuem, ours will roll 360 degrees. In addition we also intend to allow 360 degrees of motion along the pitch axis. Since our family are huge Battlestar Glactica fans we thought it would be fun to theme the interior of the simulator as a Viper fighter from the show. One big challenge for us is the physical construction of the simulator, but an even greater feat lies in the software to control the motion platform. In order for the game to feel real (and also to avoid motion sickness), the visuals that will be displayed across three 22" monitors need to be fully synced to what the rider feels in his inner ear and his stomach. Thankfully we found FlightGear, which allows us to easily read the plane's flight dynamics from the sim so we can calculate the angles to orient the motion platform. ActiveFly is a simulator just for paragliding. It let's you practice paragliding on the ground. In order to make practicing with the ActiveFly Simulator as realistic as possible, the harness as well as the risers and brakes are suspended below a frame in such a way that they can be operated. The brakes are extended and retracted via servos, simulating steering forces as they occur in a particular situation. The pilot will try to keep these forces constant by pulling or releasing the brakes. His actions can be viewed on a monitor and subsequently evaluated, allowing him to check the results and monitor progress as he develops his piloting skills. As visualizing system they use FlightGear. Some bigger images which shows the sim in action can be found in this gallery. Maybe they should use some of our new generated sceneries. But great to see how FlightGear can be used in many ways! One of the few airports that has written history, that has changed it. 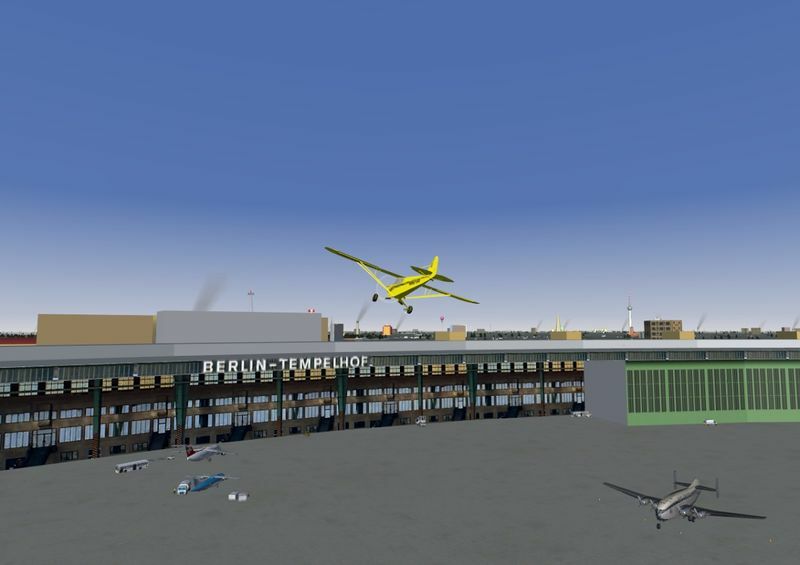 The Berlin Tempelhof Airport is in the city of Berlin. The scenery on the airport includes historic buildings, rotating antennas, a fire-drill location and many historic aircraft. Around the airport you will discover an amazing scenery. If you have ever been to Berlin, you can navigate using the landmarks and easy find your way around (towards the bierstubes at the Kudamm). Visit this place soon since the airport has been closed and will one day disappear from the map, once they figure out what to do with the terrain. Cessna 172P near San Francisco flying over the ocean. More amazing places to visit can be found at Suggested Flights. From December 26th to January 6th, Oscar uploaded a daily series in which he gave quick tips in flying and the use of FlightGear. Day 4 - Approach & Landing tips! Or watch all the episodes in a playlist. One of the regular thoughts expressed on the FlightGear forums is "I'd like to contribute but I don't know how to program, and I don't have the time". Unfortunately, there is a common mis-conception that contributing requires programming and lots of free time. In fact, there are a huge range of ways to contribute to the project without needing to write code or spending days working on something. For ideas on starting to contribute to FlightGear, you may want to check out: Volunteer. The OpenRadar project is looking for a new maintainer. The FGFSPM (FlightGear Package Manager) is looking for a new maintainer. My first contact with Flightgear was 0.91 which came with my Linux distribution. I've always enjoyed flying carrier ops - we've just come a long way in visual quality. The left picture is from my old album documenting my 0.91 adventures, the right is using the shader technology of 2.6.0. This page was last modified on 1 February 2012, at 08:30.